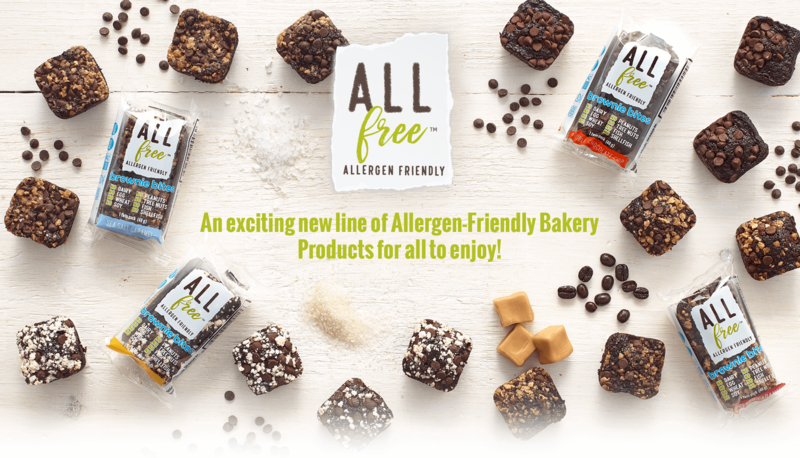 An exciting new line of Allergen-Friendly Bakery Products for all to enjoy! 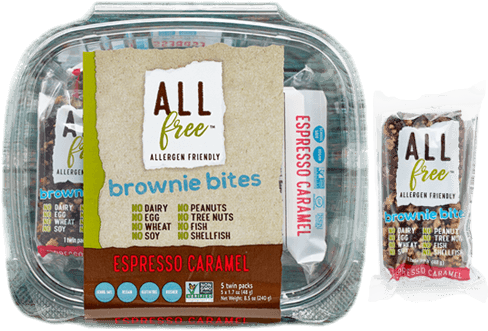 ALLfree™ products are no preservative added, school-safe, and allergen friendly. They are best kept in the freezer for freshness and can be refrozen after purchase. Once thawed they have a 30 day ambient shelf life. 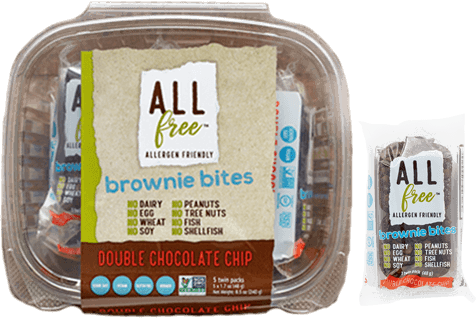 The Brownie Bites are packed in a retail ready twin pack and are the perfect grab-and-go decadent snack! A brownie so delicious, even chocolate chips can't resist! Our perfect brownie surrounds chocolate chips, offering a flavor experience unlike any other. 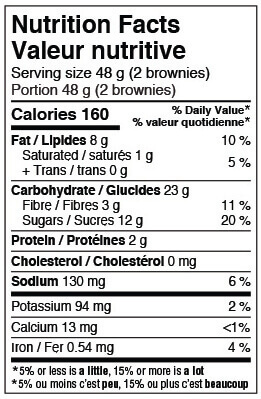 Water, Organic cane sugar, Sunflower oil, Potato starch, Egg substitute (potato flour, sugar, guar gum, sunflower lecithin, sunflower oil, enzyme), Glycerine, Cocoa powder, Whole grain rice flour, Inulin, Cultured brown rice, Brown rice, Cultured rice flour, Cellulose, Natural flavors, Baking soda, Sodium acid pyrophosphate, Sea salt, Xanthan gum. Topping: Semi-sweet chocolate chips (cane sugar, unsweetened chocolate, cocoa butter). 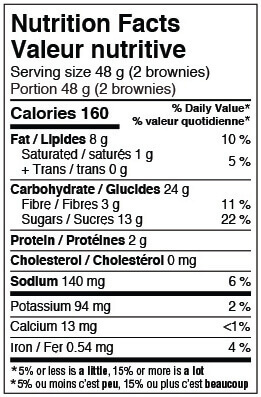 Water, Organic cane sugar, Sunflower oil, Potato starch, Egg substitute (potato flour, sugar, guar gum, sunflower lecithin, sunflower oil, enzyme), Glycerine, Cocoa powder, Whole grain rice flour, Inulin, Cultured brown rice, Brown rice, Cultured rice flour, Cellulose, Natural flavors, Baking soda, Sodium acid pyrophosphate, Sea salt, Xanthan gum. Toppings: Semi-sweet Chocolate chips (cane sugar, unsweetened chocolate, cocoa butter), Caramel & Sea Salt (sugar, brown sugar, brown rice syrup, degermed corn grits, potato starch, palm oil*, natural flavor, sea salt, cocoa powder). 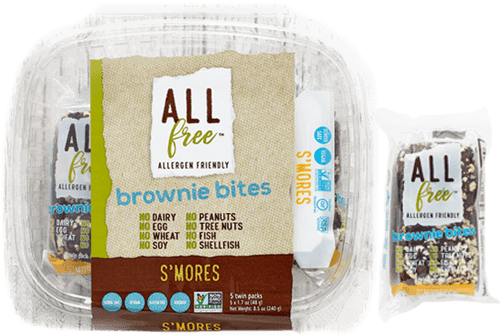 You'll love these brownie bites so much that you'll be asking for s'more after your first bite. Water, Organic cane sugar, Sunflower oil, Potato starch, Egg substitute (potato flour, sugar, guar gum, sunflower lecithin, sunflower oil, enzyme), Glycerine, Cocoa powder, Whole grain rice flour, Inulin, Cultured brown rice, Brown rice, Cultured rice flour, Cellulose, Natural flavors, Baking soda, Sodium acid pyrophosphate, Sea salt, Xanthan gum. Toppings: Semi-sweet chocolate chips (cane sugar, unsweetened chocolate, cocoa butter), S’mores (sugar, brown rice syrup, degermed corn grits, potato starch, palm oil*, natural flavor, titanium oxide, sodium bicarbonate, salt). Dark chocolate with the boldness of espresso is the ultimate flavor combo. The only way to make is better is to top it with caramel…so we did! Water, Organic cane sugar, Sunflower oil, Potato starch, Egg substitute (potato flour, sugar, guar gum, sunflower lecithin, sunflower oil, enzyme), Glycerine, Cocoa powder, Whole grain rice flour, Inulin, Cultured brown rice, Brown rice, Cultured rice flour, Cellulose, Natural flavors, Baking soda, Sodium acid pyrophosphate, Sea salt, Xanthan gum. Toppings: Semi-sweet chocolate chips (cane sugar, unsweetened chocolate, cocoa butter), Espresso (sugar, brown rice syrup, degermed corn grits, potato starch, palm oil*, spray dried coffee, natural flavor, cocoa powder), Caramel & Sea Salt (sugar, brown sugar, brown rice syrup, degermed corn grits, potato starch, palm oil*, natural flavor, sea salt, cocoa powder). 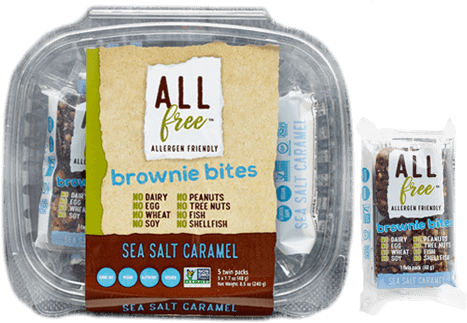 We are very excited to be launching our ALLfree™ line of products! As part of our Food Safety and Quality Standards program, we follow a strict and detailed Allergen Control Validation process. Our validation process includes a rigorous sanitization and allergen swabbing program to verify that we are clear of any allergens on our lines prior to manufacturing an allergen-friendly product. After we manufacture a product lot, we send those finished products to an accredited 3rd party laboratory to perform a final allergen test for conclusive validation. 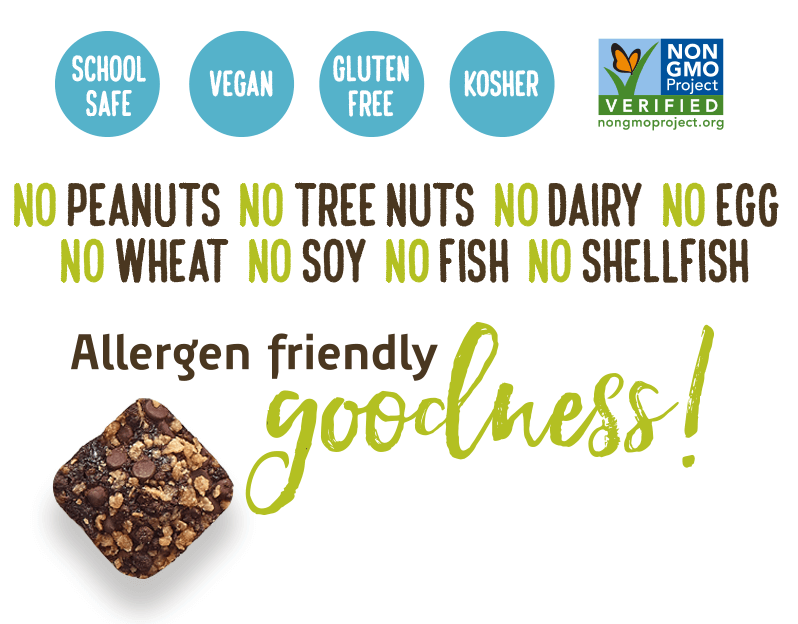 Once we receive final verification that we are clear of any allergens, we release our product into the marketplace. This procedure is performed every time we manufacture our ALLfree™ products to ensure our strict standards are consistently met.